This section of cfastusa.com is intended for dental professionals only. To verify that you are a dental professional, please answer the following question and then click the Submit button. the tongue and cheek surfaces of the tooth? Do your teeth stop you from smiling as much as you'd like? Fast — The short treatment time, on average about six months, is very attractive. Affordable — A beautiful smile suddenly becomes affordable for many. Discreet — The clear brackets and tooth-colored wire ensure worries about appearance are not a major issue. Cfast is a simple, gentle, minimally invasive cosmetic treatment that corrects alignment issues with the top and bottom front six teeth, and can level and round out the arches, thus satisfying the needs of the vast majority of adult patients who desire a more appealing smile. 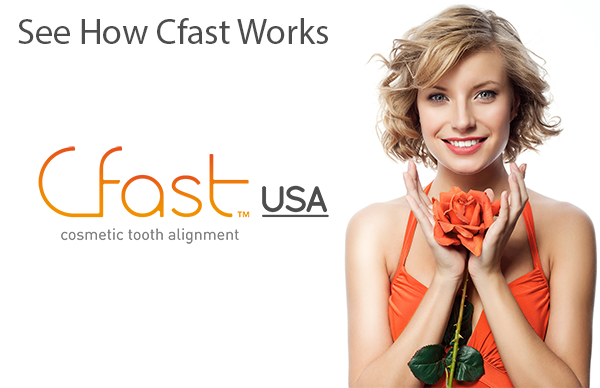 Cfast uses clear orthodontic brackets and tooth-colored nickel-titanium wires. The treatment works much like those using clear aligners, but tooth movement is much more predictable and usually completed in half the time. "With clear brackets and tooth-colored wires, Cfast is barely noticeable — and worn for only a fraction of the time compared to traditional braces."